Estonia is a little country in North East Europe, and it's famous for its...well, nothing. 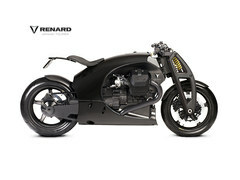 A new company, Renard Motorcycles tries to change that. The estonian engineers designed a composite monocoque chassis that houses the airbox, gas tank and oil reservoir. The engine comes from a Moto Guzzi V2, while the fairing is familiar from the Wraith concept. It looks like the company is actually to produce a handful of these in an attempt to raise investment. The eventual plan calls for production capped at 10 units a year, each retailing for €75,000. Exclusivity won't be a problem.